Orbits New Display Centre has opened! Cranbourne West has the charming and plentiful Casiana Grove estate for your next weekend visit to find your perfect home.Casiana Grove is a special place where your dreams for a new home will flourish. Uniquely positioned next to Ranfurlie Golf Club, Casiana Grove is surrounded by a wealth of schools, shopping centers and recreational facilities. An extraordinary range of open spaces in and around the estate further complements this ideal location. 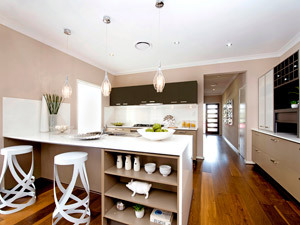 The Orbit Homes display centre in the Casiana Grove Estate offers buyers a diverse range of homes catering for any family, for any sized block. The display features the Sedona 33, from the signature collection, a stylish home offering 4 bedrooms, with outdoor living perfectly equipped for entertaining and generous sized bedrooms. If you’re looking for something smaller but still exceptionally spacious, the Meridian 25 and Napier 21 of the Access Series are perfect. The Meridian 25 is designed with practicality in mind, incorporating ample space for the growing family with two living areas, four bedrooms, a study and a generous kitchen overlooking the family meals area. With all these features this design will suit a range of buyers. The Napier 21 ultra-efficient use of space defies the apparent size. Comfortably spacious and designed for the savvy, this innovatively design house makes the best use of space. Orbit Homes can offer a diverse range of House and land packages across the South East Melbourne including: Cranbourne North, Cranbourne West, Cranbourne East, Clyde North, Officer, Pakenham and parts of West Gippsland up to Traralgon. « Orbit Staff likes. What are the Orbit Staff talking about?